Last fall I traveled to the Peacemaker Training Center in Glengary, WV, to watch the FNH USA 3 Gun Championship. To say this is a gear intensive game would be an understatement. Every firearm seems built specifically for the 3-Gun game and the list of sponsors for the match reads like a who’s who of the firearms industry. It looked to me that every firearm was custom built, even those which at first glance appeared to be factory “guns” had various match barrels, custom triggers, etc. As I drove home I pondered, what if someone wanted to get into shooting 3- Gun, but didn’t want to build a race AR? Do any of the manufactures build a competitive AR that will not cost more than a small car? Just before the SHOT Show I caught wind of a rifle from Stag Arms (515 John Downey Dr., Dept TGM, New Britain, CT 06051; phone: 860-229-9994; online: stagarms.com) built for three-gunners, the 3G model. It piqued my interest because of its features and its sticker price, under $1500. In today’s market that is a fair price for an AR-style rifle, especially a competition-built AR. When my sample 3G arrived I did a double take of it, the rifle looked like the Navy’s Mark 12 Mod 0/1. The Stag was not a Mark 12, it was in fact the 3G. While visually the two rifles look a lot alike, because they both have free-floated forearms, end user installable rails to reduce weight while allowing the end user to place accessories where he would prefer them, and they both sport 18-inch barrels with rifle-length gas systems. Stag uses nothing but the finest parts in the 3G. You will find a custom fluted Shaw barrel which is topped off with Stag’s 3G Comp/brake , Samson 15-inch Evolution forearm, Magpul’s ACS stock and MOE pistol grip. These are parts used by many shooters to customize their AR. On Stag’s 3G they are standard equipment. What makes the parts Stag chose special? Let’s discuss them briefly. 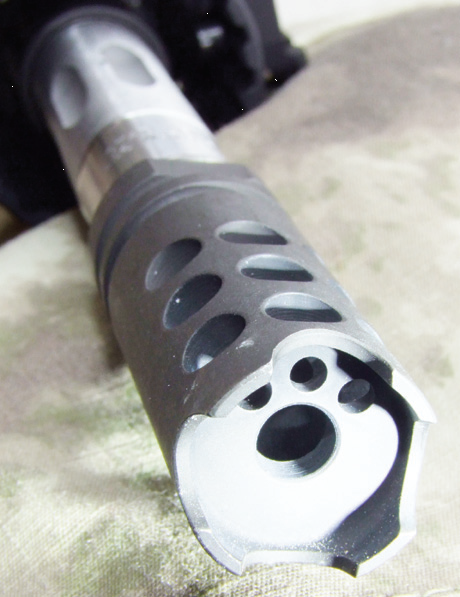 The 3G Compensator/brake drastically reduces muzzle rise. If you are running a truly hot load, you almost have negative muzzle rise; this is important on up-close and fast targets or to allow you to smoothly transition from target to target without losing sight of the target. 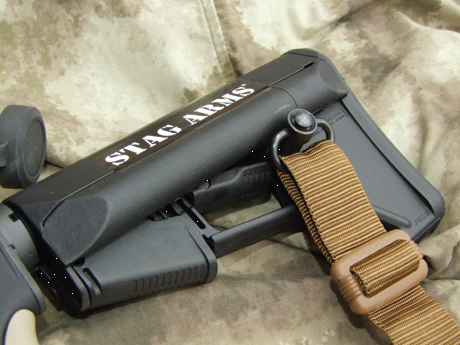 Stag’s use of Magpul’s MOE grip and ACS stock give you a comfortable grip and cheek weld. The ACS stock accommodates fast transitions to offset sights such as the RTS or other offset sight options. Other stocks don’t allow shooters to simply roll/cant the rifle and the sights literally pop-up in front of your eye. This is important for those fast close targets you can encounter when shooting 3-Gun, seconds count. The ACS also locks, so you don’t get “stock shake” which will throw off long range shots. Considering all aspects of 3-Gun competition is what sets the 3G apart from other ARs. Stag uses Samson’s Evolution forearm because it mounts solidly to the receiver, weight is reduced by eliminating unnecessary rails while retaining the full length top rail to mount sights and optics. Yet it gives you the option of adding small accessory rails to attach a bi-pod, fore grip, etc. The cutouts on the forearm give you a solid shooting grip in all conditions; something you run into on the game fields hunting or competing. After going over the externals of the 3G, I decided to check the internal components of the rifle and the lower receiver. The fit and finish of all the internal surfaces and parts were flawless. All of the parts fit perfectly and the finishes were even. The most notable internal part is the Geissele Super 3 Gun (S3G) trigger. This two-stage trigger is designed to give the shooter the smoothest and quickest trigger on the market. It is used by many top 3-Gun competitors and other precision shooters, including those in various military special operations units; they use the select fire variant. The trigger pull is approximately 3½ pounds, crisp. When you have a fine firearm, you need quality optics and secure, repeatable zero mount. I chose to use Meopta’s (50 Davids Dr, Dept TGM, Haupaugge, NY 11788; phone: 800- 828-8928; online: meopta.com) 1.5- 4×20 KD and Precision Reflex Inc.’s (710 Streine Dr., New Bremen, OH 45869; phone: 419-926-2603; online: pri-mounts.com) Gator Grip base. 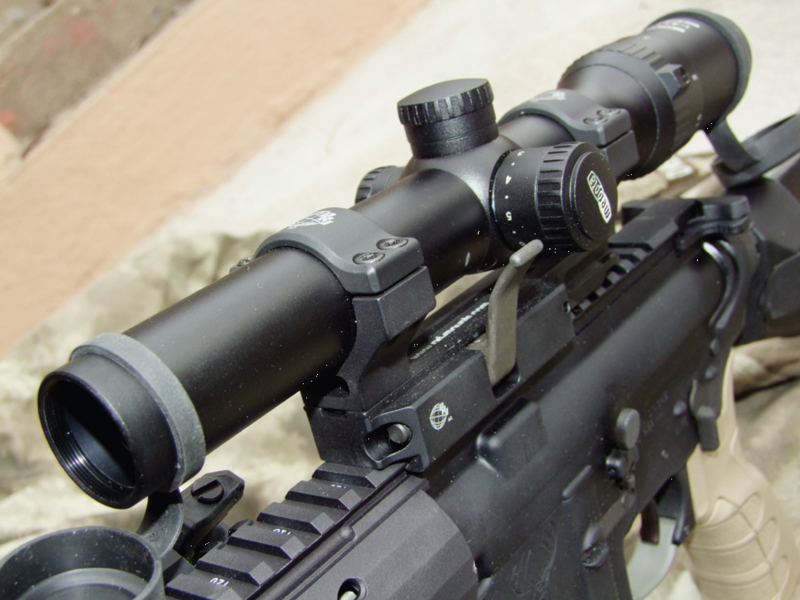 This combination will set you back about $1140; $190 for the mount and $950 the scope. These two pieces will serve you well and bring out the rifle’s accuracy potential. If you find that too pricey I suggest the Konus (7530 NW 79th St, Dept TGM, Miami, FL 33166; phone: 305- 884-7620; online: konususa.com) Pro M30 1.5-6×30 with quality mounts and you will have a set up that will cost less than $300. The M30 lists at $250 and by dropping the other $50 on good tactical scope mounts, you will be set. You will find these combinations used on various M4s I run, and I do like it and use it a lot. Since I wanted to see how well this rifle performed at distance, I did mount the M30 because of its higher magnification. Before heading to the range I gathered up a collection of ammunition. With the 1 in 8 twist I wanted to see how well bullets from 52 grains to 77 grains performed. 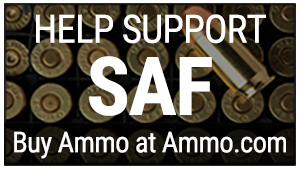 All of the cartridges could be purchased at your favorite big box store, or hand loaded. I did include my accuracy load— Nosler 69-grain BTHP powered by Ramshot’s Tac powder. What I soon found out was the Stag 3G simply shoots. It shoots well and shows no preference for bullet weight, manufacture, or bullet design. My hand loaded cartridges gave one-hole five-shot groups at 100 yards. All of the loads I had consistently fired sub- 3-inch groups off a bipod at 200. I couldn’t keep the fliers from ruining my groups. Three of the five rounds were under two inches with 62-grain to 77-grain loads. Sorry, my mid-50 eyes let me down, even with optics. I found the offset RTS sights performed well out to 50 yards. I could easily make upper A zone hits on a USPSA or IDPA target all day long. 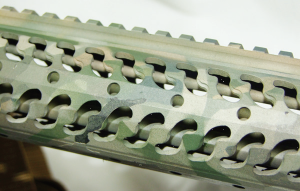 The 3G Comp reduced the muzzle rise to near zero when doing doubles or hammer pairs. On a true hose-and-go stage it can make all the difference in the world between hits and misses. The 3G Comp is one of the most effective compensator/ muzzle brakes I have used. Overall I thought the Stag 3G is a rifle that will serve novice to pro, or varmint hunter, well for years to come. The rifle is well made, feels good and, thanks to the Evolution Forearm, it can be adapted to meet the needs of hunter, competitor or those protecting the streets of the US. 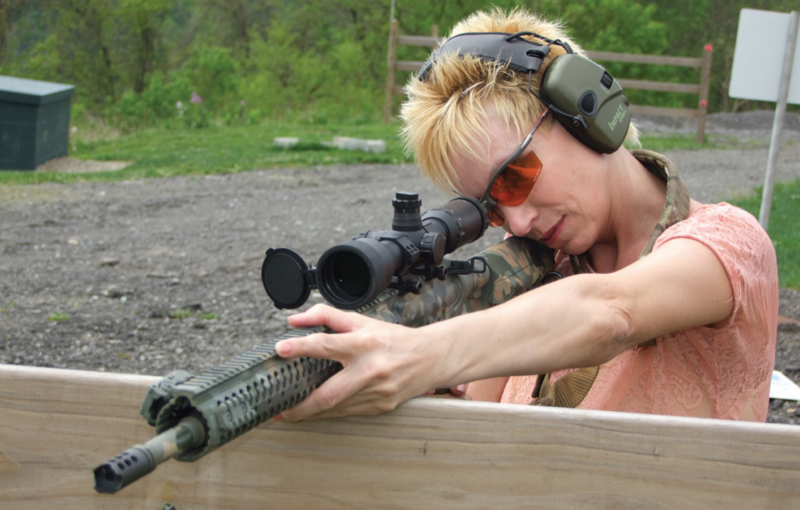 I think the highest compliment one can give a firearm was voiced by Lisa who is seen shooting the 3G: “It’s fun, it fits, and I like it.” Who am I to argue with that? Stag’s 3G rifle is fun, so is shooting; many times we forget that at the range or in a competition. So next time you take to the range, shoot fast, shoot accurately, shoot safely and, like Lisa; have fun. The 3G will help you do all of those. If you are looking for serious 3-Gun carbine, “fun gun” or a varmint rifle; consider Stag’s 3G. The 3G used in this article now sits in my vault and it makes many trips to the range.